This post is all about How to send free sms to india without registration . Now-a-days there are multiple sites which give free sms services in India like way2sms, Mycantos , 160by2 , Site2sms etc. We can use these websites to send free sms to anywhere in India. These sites are required to verify your phone number in registration process and also you have to register there before sending SMS . Yesterday I was searching on google and I have found some new sites which provide sending FREE SMS to India without registration . Currently this facility is available to Indian users only. Send Free SMS to India anytime very fast to deliver. You can’t send group SMS. No registrations or login required. Send unlimited 160 characters sms.Check message delivery in report in real time. No ads with your sms.Very high speed SMS delivery system. Send Unlimited 500 Characters Sms to any Indian numbers. This website has a option to Check Message Delivery Report in Real Time. This free sms site does not Include Any Ads Along With Sms. Very fast Message Delivery System. This website Trace I.P Address so don’t do anything illegal. Send unlimited time 160 character sms. In this site No registration is required. There is No ads included in your sms 🙂 . Most of all its Totally free of cost. This website also has some Free jokes collection. You can Invite friends & get reward. 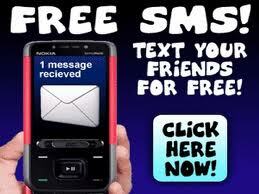 You can Send free SMS to any mobile phone in India as well as other countries! No registration required for sending free sms in India! Just write your message and click the send button and it will be sent instantly. This website allows unlimited free sms in India but it shows the last sms in its homepage without any Sender name or I.P. I don’t know why they are doing this. Well try it if you want. No registration required to send free sms in India from this site. But sometimes this site become down. Thanks for this post. I am using these services from now on. Great sites. I barely found some free sms websites list online. I like bollywoodmotion for long sms 🙂 . Cheers! Hello friend this is exciting site that provides free calls of 4 minutes to anywhere in India. It provides 20 minutes daily. I am glad to hear that Deepalika. Thanks for your valuable opinion.